What appears to be a T-34 M.1969 medium tank, suggested by the application of updated roadwheels (with one forward roadwheel seen of the earlier type.) 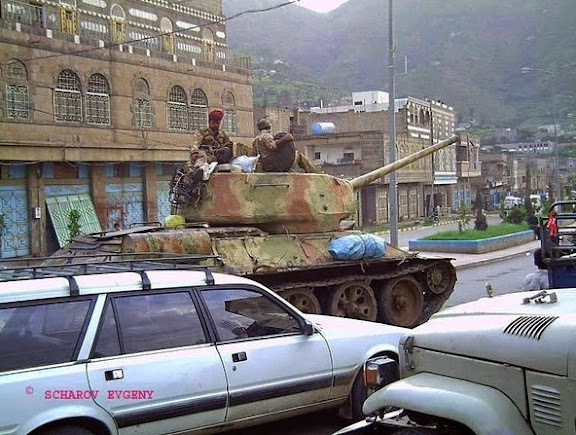 Operated by elements of an Yemen Army armored brigade, current allegiance undetermined. SU-100 tank destroyer fitted with updated roadwheels. This example may actually be a post-war production Czech SD-100 type. Operated by what appears to be elements of the same Yemen Army armored brigade as above T-34, current allegiance undetermined. Amazing to see these historic AFVs engaged in conflict as late as 2015. But this is Yemen. Don't expect them to fight with Abrams or Leopards! And here i thought i was getting old. It is not everyday you see a piece of military hardware that surpasses ones age. :-) Iran as well as Iraq also used ww2 era tanks in the 1980s. But this takes the cake! No May be time has stopped in Arabian peninsula! and these vehicles has been imported from future! They may be old and seem a museum piece. But just like a B 52 they still can be useful. Had one of these pointing my way in Croatia 91. We laughed. Then it starting firing and coming our way. We didn't laugh so much anymore. Mark does the M 1969 designation attached to the T-34 indicate it was of Yugoslav manufacture? This type of tank is more useful in Yeman because it is low tech and therefore easy to maintain in back street workshop. 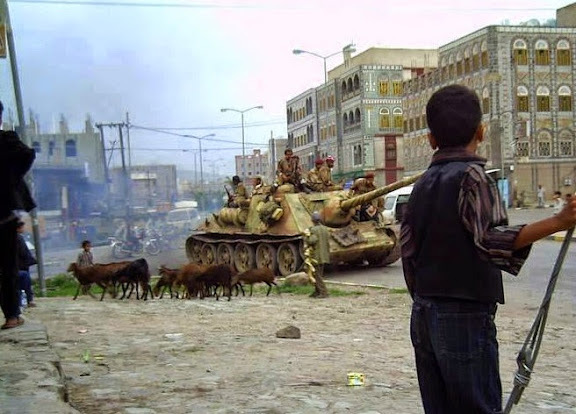 T-34s guarding a Yemeni Island. lmao this actually happened in Ukraine. The rebels used an IS-3 from a memorial or something to break through a barricade. But these outdated vehicles will perform worse than the modern counterpart. Are those T-34s operational? They look rather rusty to me. What was the war started for anyways? Why did SFR Yugoslavia break-up? Sure. So we can kill each others again.